Image © 2018 Aron Nels Steinke, art by Steinke. Mr. Wolf is about to begin a new teaching job at Hazelwood Elementary School. As the story opens he is cleaning up and preparing his classroom for the students, who are about to arrive. We also see images of his 17 students either at home, about to begin their day. 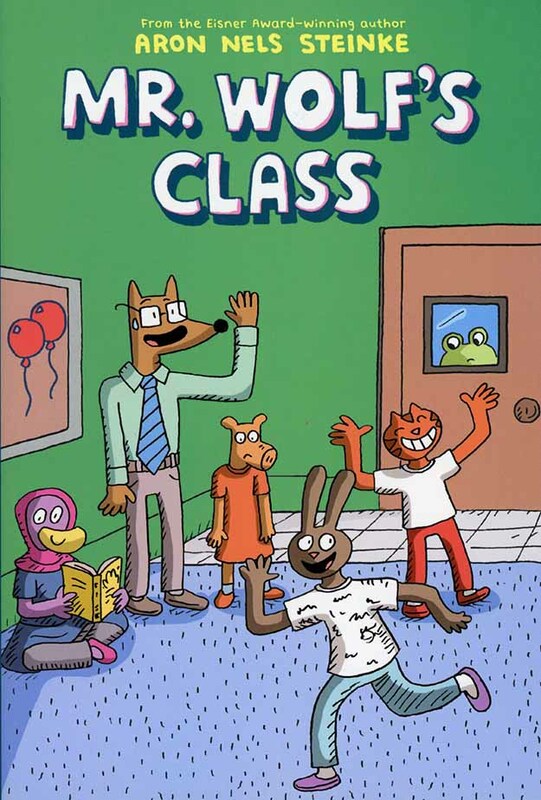 Mr. Wolf and the students are human with animal heads and characteristics, drawn in a charmingly simple style. As the book continues, we follow the adventures of each student and their teacher as they interact, make friends, get into trouble, get lost, get into fights, and generally have all kinds of adventures. The book is aimed at young readers with easy-to-read words in large balloons. I think I would have loved it as a kid myself, both for the art and writing, and because I could easily relate to it. Not a book I would have normally chosen, it was given to me at the ‘Ringo Awards in Baltimore, but I’m quite happy I read it, and I commend it to children and parents everywhere. This entry was posted in Comics, Reviews on October 18, 2018 by Todd.